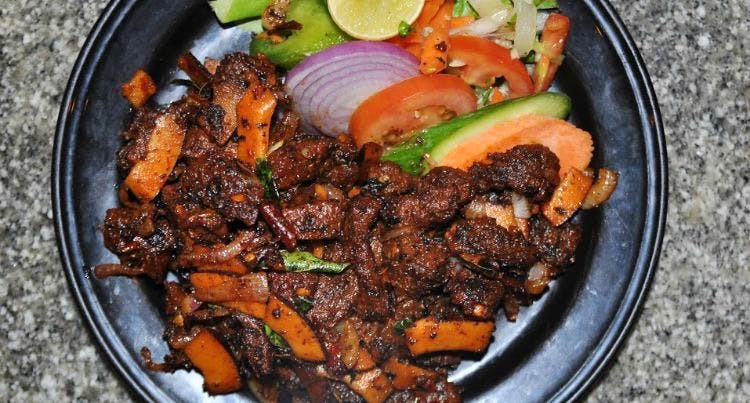 A pitcher of cold Draught Beer to begin with and a plate of Veddi Erachi, dried beef, shredded, fried with pearl onions and Crab Meat balls should be your immediate orders before even opening up the menu. The smoky flavour of the chewy aged meat spiced with pepper and dried red chilli, and those pods of sweet, caramelised onions work as a perfect companion to the beer. The sweet meat of the crab is shallow fried in breadcrumbs and is served with a sweet house sauce. For the main course, you will not go wrong with choosing any of the options on the menu but our favourites are – the Pandi Curry, the Cochin “Bad Word” Curry and the Ulli Theeyal with a couple of Muttai Appams and a plate of Sannas. The Pandi Curry – a traditional Coorg speciality of succulent, slow cooked pork cubes with the signature kachampuli, a molten souring agent from Coorg, as a flavouring, which gives this dish its rich, dark, tart flavour – is especially good here and goes well with the fluffy Sannas. The Cochin “Bad Word” Curry or the beef mince balls in a flavoursome tomato sauce is great to eat with the Muttai Appams, an appam with an eggy Bull’s eye in the middle. The Ulli Theeyal, a thick gravy of pearl onions cooked in tamarind water and delicately spiced, goes best with rice. Your meal here ought to be wrapped up with another favourite: the Tosca Cake served with Vanilla Ice Cream. This dessert unique to this establishment is wonderfully, light sponge with an almond crust, which isn’t overly sweet but just right. The decor hasn’t changed much since this haunt opened over two decades ago. It’s got leather sofas that line the walls and the rest are straight-back chairs around marble-top tables. There are a couple of framed posters on the walls and a wooden bar to one corner. The music skips from John Coltrane to Miles Davis or the sing-along rock hits from the college days of yore. Windsor Pub is the place, we might want to spend all our Sunday afternoons – drinking beer and belting good food – with old friends and raucous laughter.